Morecambe keeper Mark Halstead is looking forward to making up for defeat earlier in the season when the Shrimps travel to Oldham Athletic tomorrow. 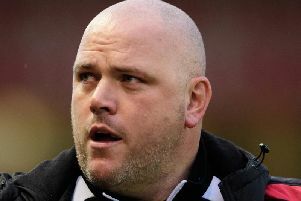 Jim Bentley’s players were beaten 2-0 when they met Latics at the Globe Arena at the end of August. It was a game that saw Halstead make his debut for the Shrimps following Barry Roche’s red card against Northampton Town four days earlier. Two goals in as many minutes saw Morecambe beaten with Oldham keeper Daniel Iversen producing a man-of-the-match display. “We go to Oldham on Saturday and we need to look to go there and put some wrongs right after they beat us 2-0 at the Globe Arena,” said Halstead. Bentley’s men go to Boundary Park sitting 22nd in the table, two points ahead of second-bottom Macclesfield Town. A run of only one win and six draws in their last dozen league matches is responsible for the Shrimps’ seemingly annual battle against the drop. The most recent point came at Northampton Town last Saturday when Richie Bennett’s first goal for the club salvaged a 1-1 draw. Halstead said: “We didn’t start too well. “I made one or two saves as they put us under pressure but in the second half we came out fighting and we could have gone on to win the game. “I always thought that if anyone was going to win the game after we pulled it back to 1-1 it was going to be us. “I wasn’t really troubled after our goal and I thought we were gong to win it but unfortunately we didn’t.